I thought they were were really tasty, they packed a good amount of flavour and crunch and were really fresh. I think a ridged crisp is generally crunchier and gives good texture. You can tell that the crisps have 30% less fat, they aren't greasy, have a drier texture - they go well with a cold beer I think - although that kind of undoes the benefits of less fat and all that good fibre! The kids liked the lightly salted flavour, they weren't keen on the other flavours, but that's no reflection on the crisps themselves as they don't like flavoured crisps as a rule. I do like the way they tentatively try unknown crisps though - very lightly sticking their tongue on them to assess the flavour before accepting or rejecting them! I also am the luck owner of a licked crisp if they decide its a flavour they don't like! We took them on quite a few National Trust picnics and shared them out with other kids who also snaffled them quite quickly. Now here are the facts! 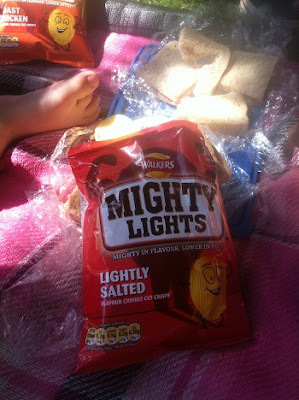 With 30% less fat than standard crisps, Mighty Lights are perfect for kids' lunchboxes. They are tasty, ridged crisps. All the flavours are suitable for vegetarians, and are available in shops nationwide. They're made from real potatoes with no artificial colours or preservatives - and they're a source of fibre. 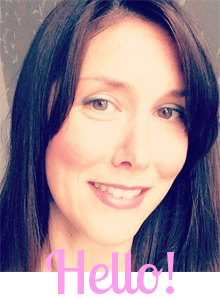 This one is great for involving the kids as they love bashing up the crisps! 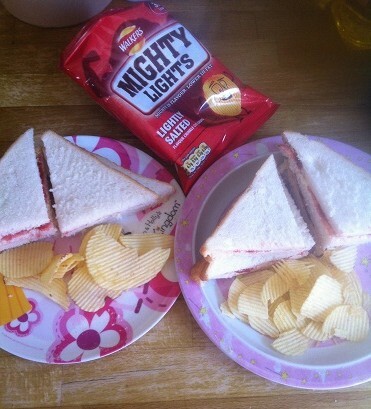 We'll definitely be buying Walkers Mighty Lights again and with lunchboxes becoming a regular thing in our house with Isla starting school this September she might find them in her lunchbox occasionally. That looks a yummy recipe, will give it a go! We quiet liked them too!